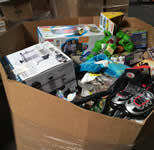 Mixed General Merchandise truckloads are probably the best "Bang for the Buck" loads on the liquidation market. The General Merchandise Pallets in the load can add 12 or more departments to your store. 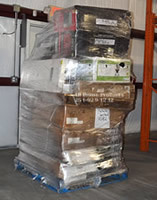 Some of these General Merchandise Pallets have many items in the $30 to $300 range making them ideal for auctions. Other pallets contain high piece counts with many items $20 and under making them ideal for flea markets. General merchandise truckloads have always been good for wholesalers that sell general merchandise pallets to those that can't afford truckloads. General Merchandise truckloads are our most popular and best selling loads with retailers, auction houses, and wholesalers. 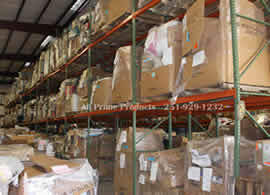 General merchandise pallets in general merchandise truckloads can consists of a nice assortment of department store overstock and department store returns truckloads, liquidation, overstock, customer returns, and closeout merchandise including tools pallets, toy pallets, electronics pallets, housewares pallets, sporting goods pallets, hardware pallets, home décor pallets, and more. We offer a great selection of popular department store returns, customer returns, surplus and closeouts. Most of these items can be DIRECT SHIPPED from their source. That way you get the full general merchandise truckloads in tact with no middlemen cherry picking the general merchandise pallets. Off price department store returns, liquidations, closeouts, and surplus products are the way to go. Purchase for pennies on the wholesale dollar. Sell mixed general merchandise truckloads with pallets of liquidations, closeouts, department store returns, and customer returns to your customers at big discounts while maintaining big profit margins. General merchandise truckloads full of general merchandise pallets are a great way to compete in today's retail environment.